Yang Borun, a native of Jiaxing, Zhejiang province, was a famous painter and calligrapher of the Shanghai school in late Qing dynasty. His other alias and style names include Peifu (佩夫 or 佩甫)，Chachan 茶禪 or Chachan jushi 茶禪居士， Nanhu 南湖 or Nanhu waishi 南湖外史. His calligraphy and painting follow the styles of great masters, such as Yan Zhenqin (709 -785) and Mi Fu (1051-1107), and Dong Qichang (1555-1636). Asian Art Department, AGNSW, April 2013. 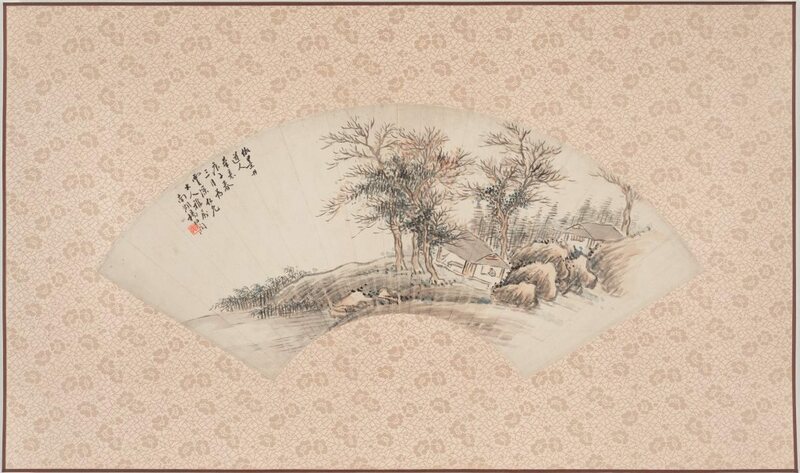 Signed and dated 1900 "Painted after the brush idea of Mojing Daoren [Mojing Daoren is a style made popular by Wu Li (1632-1718) who was a famous Qing dynasty landscape painter] at the request of my dear friend Mr Yunshen in March, spring of year gengzi (1900) by Nanhu Yang Borun."